The tale of Spencer Square is one that has a beginning, a middle, and, sadly, there’s also an end. But it’s a long enough story – and there are enough postcards scenes of it – to tell the story in different parts. The full block it occupied in downtown Rock Island, between 19th and 20th Streets and Second and Third Avenues. was originally owned by pioneer settler, Judge John W. Spencer. Judge Spencer deeded the land to the city in 1855 with the stipulation that it always have a public use. At that time, it was known as Church Square or Union Square. That was because of the judge’s early vision for this spot. In 1836, when it was annexed to the city as part of the Spencer & Case Addition, he planned that its four corners would be occupied by churches. Among the congregations that either built in the square or shared quarters in the schoolhouse at its center were the Methodists, Presbyterians and Baptists. The presence of the churches on this swampy piece of land that regularly flooded after rainstorms provided the inspiration for the name of Church Square. The other name of Union Square was reportedly because these churches had first “united” by sharing quarters in the central schoolhouse. And there’s a third name, too. An 1857 map identifies it, probably erroneously, as Washington Square. But if the names were confusing, it’s likely because no one had very high regard for this land, especially after the church congregations moved on to larger and grander edifices elsewhere. Although the square was called a park and was occasionally used for concerts and other events, it had few improvements – and still became a morass when it rained. In 1868, a local newspaper exasperatedly said that, if the city can’t sell Union Square (referring to Judge Spencer’s stipulation), they should at least mow the “villainous” weeds. The turning point came when people demanded that the park either be improved or abandoned. The community rallied– improvement it would be. Mayor McConochie appointed attorney William Jackson to a newly created post of park commissioner. Jackson got to work right away. He laid out a grand design for the square and called upon citizens for donations. In 1880, the square was graded and filled, ending the flooding. Streets and sidewalks leading to the square were paved, reportedly with rock quarried on the site. 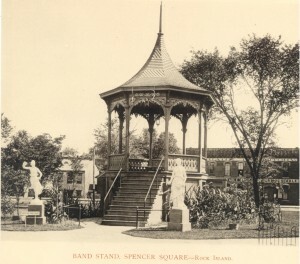 A bandstand – the one pictured on the featured postcard – was also erected. The view on the postcard is looking toward the south. The buildings in the background are where the Fort Armstrong Hotel will be built at a later date. Donations flowed in, adding amenities to the park on a scale that was unprecedented. And with the improvements came a new name, Spencer Square, in honor of the old judge and his dream of public use. 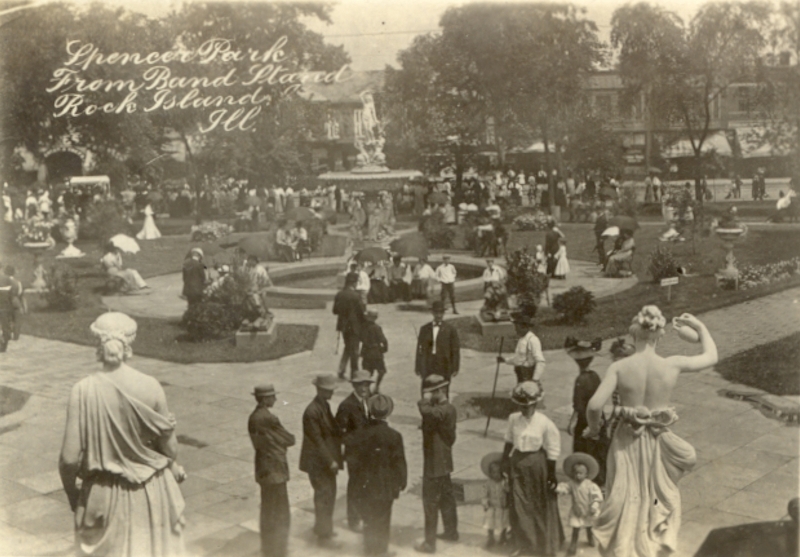 The park was completed and dedicated on September 17, 1890. 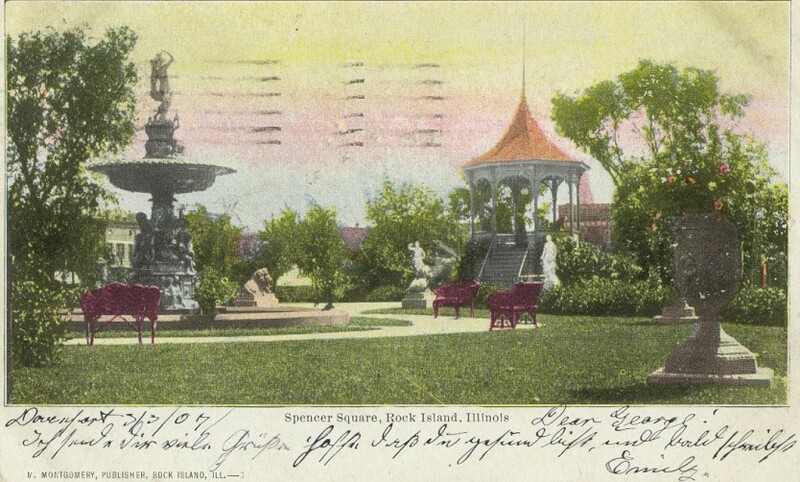 In one of the many speeches that day, William Jackson said that it had been transformed from a frog pond to a place of “pleasure, pride, and rest.” Another early settler, Judge Drury, noted that “all of Rock Island was a park” 52 years ago when he arrived here. What did this park look like at its dedication and for many years thereafter? A description begins with what is known as the “plan” or footprint, which is the view looking down on the square as if from a balloon. To start with, sidewalks surrounded the entire block. At each corner a tall iron gateway with a pointed or Gothic style arch framed a wide brick or stone sidewalk that extended to the center of the square. A second wide sidewalk was inscribed in a large circle within the square, intersecting the diagonal sidewalks. The postcard shows the area near the very center of the park, where the diagonal sidewalks met. The very Victorian-looking bandstand pictured at the right of the featured postcard was just south of that intersection. In front of it were two statues, one of Greek goddess Hebe, a daughter of Zeus, who represented domesticity. The other was Flora, the Roman goddess of flowering plants. A close rear view of these statues is shown in another Real Photo postcard, taken with the camera pointed toward the northwest from the bandstand. The fountain on the left, which also included much figural representation, including nymphs encircling its base, was just north of the intersection. It was the gift of Ben T. Cable and his sister, Mrs. George Castleman. 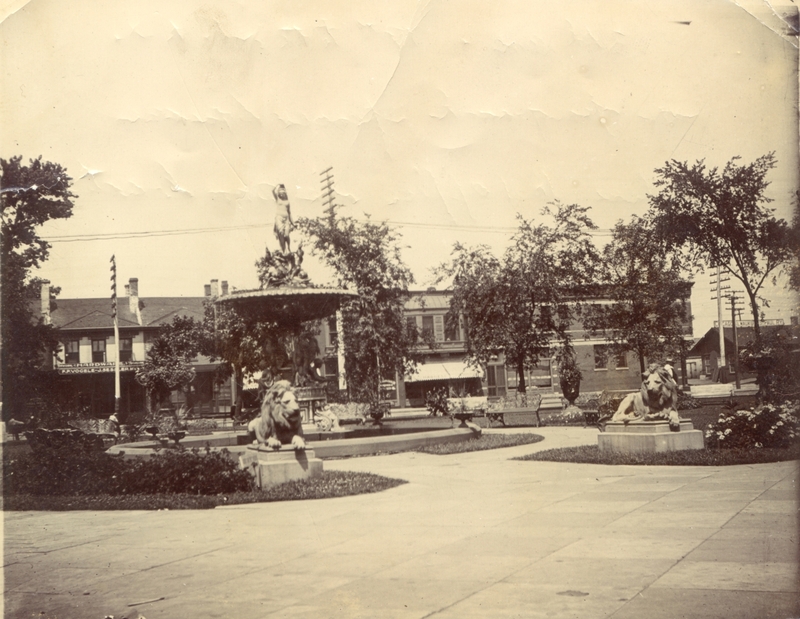 Cable’s support – the fountain was estimated to cost $25,000 – was reportedly inspired by his travels in Europe where “much attention is paid to public grounds.” Notice the well-known crouching lions just right of the fountain, facing the bandstand. These were the gift of Frederick Weyerhaeuser. A Real Photo postcard (see left) shows a better view of the fountain and the lions. This picture is looking toward the north from in front of the bandstand. Yet another Real Photo postcard offers a better view of the lions in front of the fountain. Another photograph (not a postcard) that is shown at the right taken circa 1893 and published in a book gives a different view of the bandstand. This tale of Spencer Square will continue, but for now, just imagine wending your way through this place of “pleasure, pride, and rest,” perhaps enjoying one of the iron benches while the tinkling waters of the fountain drown out other city noises. Very European indeed! This article by Diane Oestreich is slightly modified from the original, which appeared in the Rock Island Argus and Moline Dispatch on October 6, 2002.